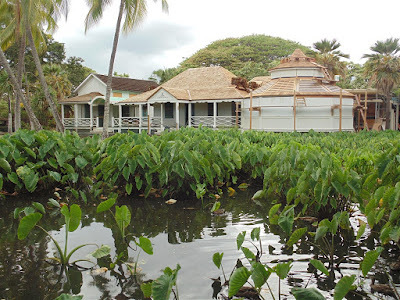 Here are some taro fields and a plantation style house at Moanalua Gardens. There are also koi and ducks in the pond. Its just a nice relaxing place and its hard to believe is is right next to the freeway. This park also has the world famous Hitachi Tree. This entry was posted on Monday, October 5th, 2015 at 12:41 am	and is filed under Feature, CityPhoto, cultural, Hawaii Photo of the Day, Attractions. You can follow any responses to this entry through the RSS 2.0 feed. You can leave a response, or trackback from your own site.